The Meizu MX 4-core has a 4" screen, which given its 3:2 aspect ratio is noticeably bigger than the 16:10 and 16:9 four-inch competitors. 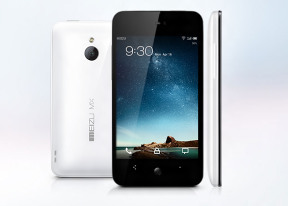 However the new quad-core top droids comes with 4.7" to 4.8" screens, which dwarf the Meizu MX 4-core display. 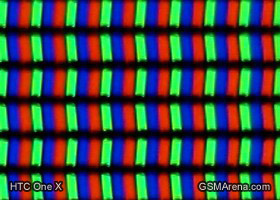 The ASV LCD unit has 640 x 960 pixel resolution, which is the same as the Retina display of the iPhone 4 and 4S. That may've been impressive last year, but the competition has taken a huge step forward since. 720p is now the norm, so no one is going to be too excited about 288ppi (even though it's really as sharp-looking as it gets). Here are the brightness and contrast measurements for the display. You can find more about the testing procedures here. The sunlight legibility is nothing to write home about either as seen from our in-studio measurements. It's still slightly better than on the original Meizu MX thanks to the increased brightness. We zoomed into the display using our digital microscope so you can get a better idea of how the pixels are arranged, and how big they are. 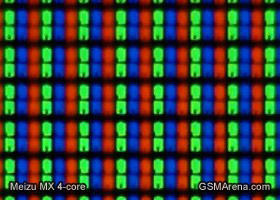 As you can see the pixels are about as big as those on the HTC One X, which suggests about equal perceived sharpness. The Meizu MX 4-core is comfortable to hold in the hand - it's not too big, too heavy or too thick. We wish the phone had higher quality finish and more secure grip, but if you can get over that (or are going to use a case/pouch) there are no complaints about the build quality. While it has its flaws, the hardware of the 4-core should get the attention of serious buyers. Having tried the original Meizu MX, we know the software has its way to impress too. The highly customized FlyMe OS is coming up, followed by the usual round of benchmarks, which should allow the Exynos 4212 Quad to flex some muscle.